The first seedlings have made an appearance. It’s the time of year when I start compost watching. 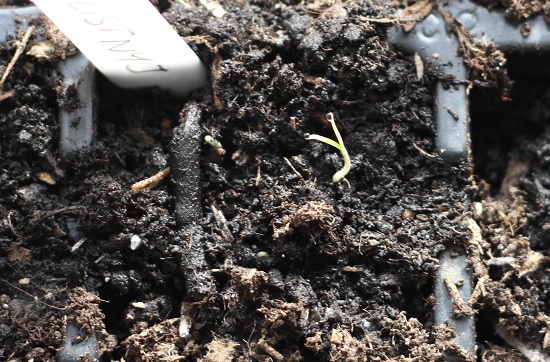 Regularly checking in on the seed trays to see what has germinated, which translated means popping into the room where they are germinating in the warmth and sun, and staring at compost. Invariably nothing happens for days. And then when your back is turned, up them come. It’s a long way to go till summer when I get the first pickings of these tomatoes. The tomatoes along with the peppers and chillies, have gone on a small journey, a temporary move 3 doors down to our friends and neighbours to look after them while I’m away. Bon voyage mes amis! Stay safe, no more falling over please! I could say the same too for your little seedlings 🙂 Hope they grow well. good luck tomatoes ! … ours here are just coming out, all finished already in this strange summer weather .. they did produce a huge crop which is all bottled and preserved in different ways to enjoy through the winter 🙂 …. do you make Kasaundi with yours? Have a safe journey. I know you will be pleasantly surprised to see how much your plants have grown when you return. Oh yes that will be a goo dsight to greet me on my return 🙂 Thank goodness I have great friends! It’s an odd thing to say but I’m looking forward to that job when I get home!! Safe journey back to France…almost time to come home for good! Yaaaay indeed! We actually have the apartment till the end of April, so I’ll be popping back and forth, it just makes me wonder how much actual gardening I’ll be able to fit in…. Thank you Tandy, I’m back safe and sound now, travelling through France by car is very easy and quick, but it’s always nice to reach your destination and flop in a heap! Can’t wait to see how much the seedlings grow when we see the next photos, what fun! Have a safe and enjoyable trip! Travel safely dear Claire and have a nice travel. 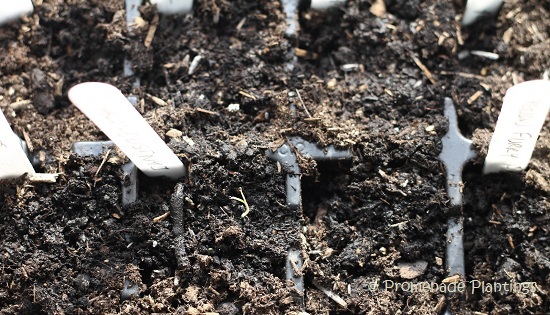 It would be so nice to see your seedlings grow. Merci and I hope you have a great week, I must pop over and see what you have cooking, something delicious I bet! Happy happy travels! Life awaits you, away and more when you return! What a nice neighbor you have! I know, they are so kind!! I just caught up with your most recent posts, so…..
emergence—YAYYYY! I swear I get more excited by the first soil breakthrough than the entire rest of the plant!!! your promenade and stops along the way—I know I’d linger at that coffee shop, because coffee by the beach is one of my top things to do here! I thoroughly enjoyed your picture tour and imagining the brisk sharp air! Mardi Gras—i love the Lenten season! It’s the only time the stores in the U.S. sell Hot Cross Buns….and I LOVE hot cross buns so much, if i were a truly good Catholc I’d have to give them up! I love the first sight of seedlings almost more than the watching the rest of the plants coming in! I know exactly what you mean, you can’t help but be amazed that tiny seeds could have all the information packed into them, and out they pop! Hope your travels go smoothly and are filled with happiness–and that on your return you’re greeted by hale and hearty–and hardy–tomato plants and much more! Oh hale and hearty would be good! I’m so excited, my tomatoes finally came out this weekend! Guess they liked the 80 degrees on Friday… so now we are back to cold, but who cares? Spring is officially just around the corner!